We at Right Off the Bat have a fondness for stadiums: those temples to the arts of cricket and baseball. For all their inherent grandeur, however, they often find themselves placed in some less than beautiful surroundings—yes, we’re talking about you, Yankee Stadium and Citi Field. 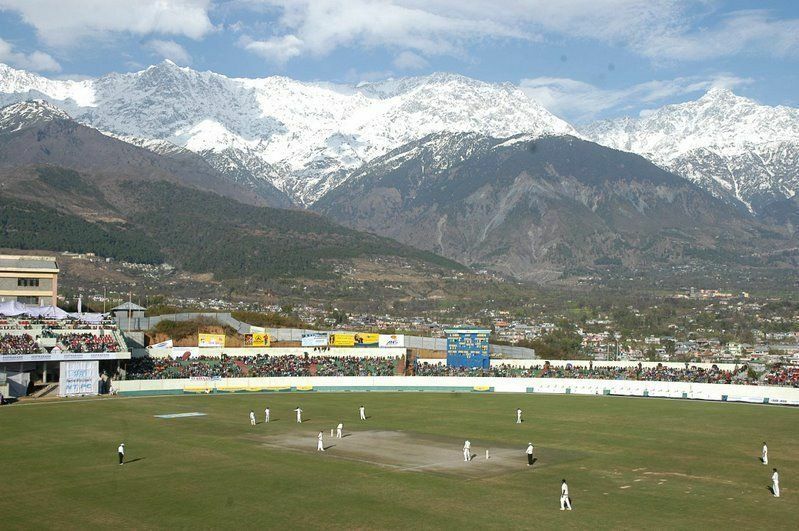 Consider, however, playing cricket at one of the newer stadiums to feature international cricket: the Himachal Pradesh Cricket Association Stadium in Dharamshala, the home of the Dalai Lama of Tibet. We realize that it can be distracting to keep one’s eye on the ball when you’re surrounded by jeering fans of the opposing team, but, we ask, how could one concentrate when surrounded by this?! This entry was posted in Baseball, Cricket, Stadiums, Yankees and tagged Citi Field, Yankee Stadiium. Bookmark the permalink. What is the oddest venue for cricket or baseball? I did watch cricket played near the harbour in Corfu. But I think the day I saw Joel Garner, Brian Lara and Clive Lloyd (match ref) in Brooklyn in what is essentially a field carved out of a reed marsh near JFK was the oddest I have seen. I (Evander) will give you several for baseball, Nick. Abner Doubleday Field is hardly an odd venue. But I found myself along with a friend visiting there during the time of the Watergate Hearings, being interviewed by a New Zealand (!) journalist who was canvassing “the College Student on the Street.” In that late afternoon, we three were the only ones on the Field at all. Perhaps stranger as a locale is the original setting for Toronto Blue Jays games. Exhibition Stadium is within the confines of the Exhibition (at least at one time) open for maybe two weeks a year. The stadium, which featured unusual double “love seats” in its expansive left-field stands, was set amid amusement-park rides. Two more: Aside from the 1936 Olympics Games, where under the klieg lights 100,000+ undoubtedly watched baseball in utter incomprehension, the L.A. Dodgers stint in the Coliseum (constructed for the preceding Summer Games, as I think Cleveland’s Municipal Stadium was, which never saw an international-sports event as far as I know), with the short home-run distance to left, even with the monster screen, might be the silliest of all. Though I’m pretty sure he was a left-handed batter, Wally Moon perfected the so-called Moon Shot, over the screen, in 1959. Fans in right field might as well have been in a different time zone: the game was a rumor from there. That World Series was versus the Chicago White Sox, whose ancient Comisky Park itself showcased seats, in places, which faced one another rather than the field.